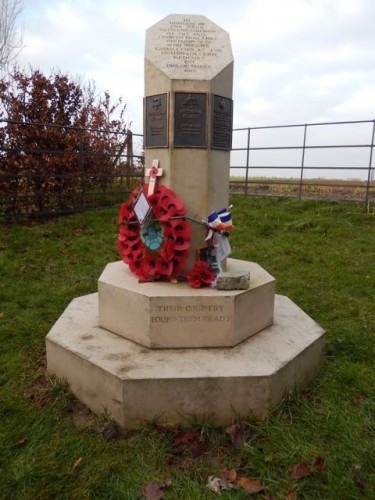 Next to a muddy track and on the edge of a new housing estate stands a small monument recalling the bravery and hopelessness of one small battle on the Western Front. The monument is to the soldiers of 46th (North Midland) Division which stood here in October 1915. And among them were B Company of the 5th Battalion, Leicestershire Regiment. These men, from Oakham and the surrounding villages, were Territorials who had marched off to war more than a year earlier, while bands played and crowds cheered. And it was here, near the village of Auchy-Les-Mines they went into action as a Battalion for the first time against a German strongpoint known as the Hohenzollern Redoubt. The Redoubt was a bump in the German line, surrounded by trenches and protected by machine guns. An attempt to take it had already failed. Now it was the turn of 138th Brigade, and the men of Rutland, to try to break through. B Company was in Reserve and when it finally went into action it met surviving soldiers from the earlier attack streaming back towards the British lines leaving their dead behind. The artillery bombardment had not been sufficient, the German machine guns were still in action. The result had been slaughter. The next attack fared no better and the Hohenzollern held firm. B Company got off relatively lightly with only three dead with many others wounded. But the action marked the Company who knew from that point winning the war be long, arduous and very costly.